The Folder Tree which shows a list of all the folders in each directory. 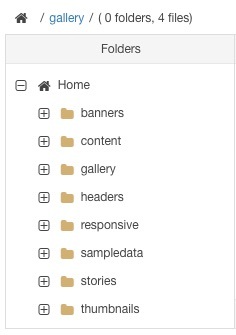 Click on a folder name to open it, or on the plus icon to expand the tree and show the folders it contains. The File List shows all the files and folders in the current directory. 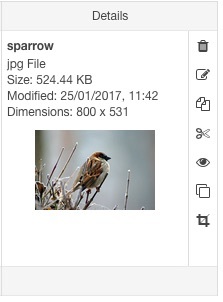 Click on a file name to select it for inserting or editing. 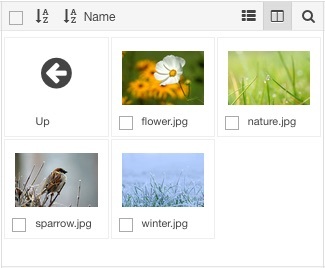 Click on a checkbox to select a file for editing. Multiple files can be selected and de-selected by clicking on each files checkbox. Use CTRL + Click and SHIFT + Click to select multiple files. Click the Name button to sort the list by name. Click the button to toggle the Folder Tree panel. Click the button to show the Filter input field. Type into the field to filter the list. 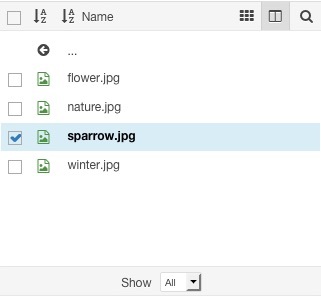 The Details panel shows information about the selected file or folder - including a preview in the file is an image - as well as a list of actions that can be performed on the item.